Little Shop of Horrors, based on the 1960 B-movie of the same name, has come to represent a high point in campy musical theatre. The story of a man-eating plant from outer space and its bedeviling of a skid row florist’s assistant, which probably ought to be the stuff of nightmares, was revised by Howard Ashman and Alan Menken into a glorious send-up of the kind of silly SF that abounded in the late 50s and early 60s. In its newest incarnation at the Drury Lane Theatre, all of the silliness and macabre, crowd-pleasing fun is revived under the capable direction of Scott Calcagno. For anyone who doesn’t know: the story involves Seymour Krelborn (Will Lidke), a self-proclaimed loser who works for Mushnik’s Florists on skid row of an unnamed city. Mushnik (Ron E. Rains) also employs a lovely young woman named Audrey (Kelly Felthouse) who has such low self-esteem that she allows herself to be beaten by her boyfriend (Steven Strafford, who plays multiple roles). Enter Audrey 2, a “strange and interesting” plant that basically falls into Seymour’s lap during a sudden solar eclipse. When Seymour discovers that the plant will only thrive when fed human blood, he at first gives it drops of his own, but as it grows it demands even more. And, yes, the plant talks (and sings); its voice is provided by Lorenzo Rush, Jr. while puppeteer Matthew Sitz works its movements. All of this is observed and sometimes narrated by a trio of singers quirkily named Ronnette, Chiffon and Crystal (Melanie Brezill, Melanie Loren, and Candace C. Edwards, respectively), who also assume multiple roles during the show. This is a show that is at its core a love story between Seymour and Audrey, but one tainted by the presence of a powerful darkness that requires human sacrifice. As Seymour falls more and more into its thrall (it can, like the devil, grant him all of his life’s desires), the question of how far he will go for love is answered in the most horrific of ways. And did I mention that this is a very funny comedy? Yes, the horror is played for farcical fun, with lines like “the guy sure looks like plant food to me” and multiple “shang-a-lang”-type refrains tempering the potential for terror. Done well, Little Shop is almost a guaranteed audience-pleaser. Drury Lane, of course, does it extremely well. With Calcagno at the helm, the three singers (whose sparkling, wonderful costumes are provided by Linda Myers) perform like classic girl groups of the era, complete with Supremes gestures and harmonies and dynamite vocal chops. Calcagno uses them to create a kind of visual barrier between us and the horrific goings-on at the florist shop, while using the many ludicrous character portrayals (starting with Audrey but including every character played by Strafford as well) to keep us at a distance from any potential for reality. (The decision to go with only a single actor to take on all of these parts ramps up the camp even more, and Strafford has a great time with it.) Felthouse and Lidke are perfect as the lovers, from the comic speaking voices they adopt to their wonderful vocals in their songs. Rains is excellent as the overwhelmed Mushnik, and Rush creates a dangerous enemy in the plant using just his deep, resonant voice. Little Shop, though, is one of those shows that lives and dies on the tech side, and fortunately Calcagno has plenty of help there as well. Kevin Depinet’s set, making great use of a turntable to aid in the growth of the plant, is realistically shabby with touches of whimsy in leaning lampposts and other things that signal there is something askew here. Ryan O’Gara’s lights and Ray Nardelli’s sound design keep us focused and part of the action. But it is always going to be Audrey 2 itself, here designed by Martin P. Robinson for Sitz to operate, that is the be-all and end-all for this show. Execute the plant well and you have the evil that lies at the heart of the show for everyone else to play off of. Here Audrey 2 is as living a character as any of the actors, and this is necessary for the show’s pastiche of horror and comedy to work. Little Shop of Horrors is a gloriously enjoyable show. Its fun, often frivolous lyrics contrast well with its darker side. Even its final message is simply a warning: “Don’t feed the plants,” which feels like the understatement of the century after watching Audrey 2 wreak its havoc for two hours. This production, as will any good one, runs with the camp, making the audience more involved. We never have a moment to question our laughter at such horror thanks to the great performances, and all that remains is our entertainment, which Little Shop provides nonstop. You might go home and take a second look at your houseplants, though; you never know what they might be plotting. 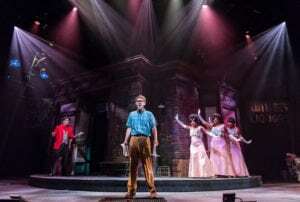 Little Shop of Horrors is now playing at the Drury Lane Theatre, 10 Drury Lane, Oakbrook Terrace, until Oct 28. Performance times vary; check the website at Drury Lane Theatre for tickets, schedule and times. Find more information about current plays on our Current Shows page and at theatreinchicago.com.